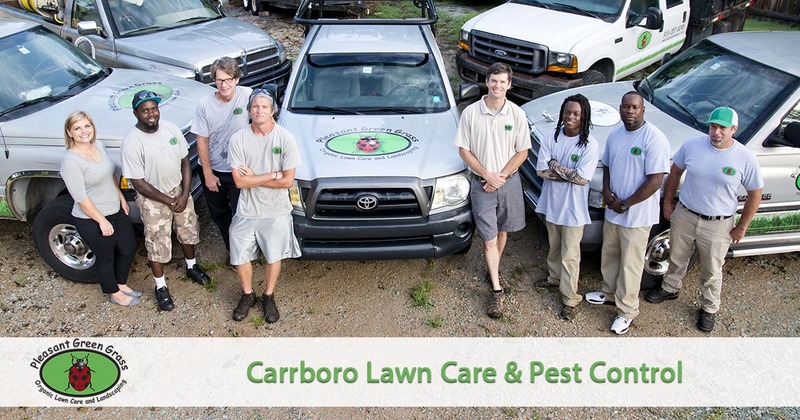 If you are looking for effective lawn care and pest control services in the Carrboro, NC area that are safe for your family and pets, then look no further. Pleasant Green Grass offers organic lawn fertilization and pest control services that are safe for your family and pets. The town of Carrboro, NC, has long been known as the Paris of the Piedmont. And while you won’t find the Eiffel Tower here, you can discover gorgeous weather and friendly folks. When it comes to keeping the community green, it helps to know that your landscaping team remains the top choice in organic solutions. At Pleasant Green Grass, we offer the best in natural lawn care services. Treat your yards right with the care that nature intended. Stop relying on toxic sprays and let us keep your lawns green! Since 2006, we have achieved better results without chemicals. We offer monthly yard maintenance, core aeration, complete lawn renovations, and more! Whether you need better grass fertilization and weed control or need help redesigning your backyard, our team is here for you! Call now to hear how we can solve all your problems the correct way. Call us when you need the best in natural lawn care. We get better, organic results on every visit. The south is known for two things: its hospitality, and its insects! But no matter what’s bugging you in your yards, we can take care of it! We provide all-natural lawn pest control to handle all your pests with ease. From mosquitos and fleas to pesky ticks, spiders, grubs, and more, we chase all your bugs away without the harsh toxic sprays! Call now for your best outdoor pest control services. We treat your yards right each time! If you’re tired of filling your yard with chemicals, then it’s time to take a different approach. Call our team today to give your lawns the best in complete natural yard care solutions! The organic lawn fertilization and pest control services we offer in Carrboro, NC are healthier, safer, and more effective than traditional chemical applications that are harmful to people, pets and the environment. Give us a call today and experience the difference in working with a company that cares as much about the safety of the products we use as we do for our customers.